Next year's second issue of Shogakukan's Big Comic Superior magazine is announcing on Thursday that Moonlight Mile creator Yasuo Ohtagaki is launching a Gundam manga mini-series next March. The manga will depict the One Year War seen in the first Mobile Suit Gundam anime series. Big Comic Superior had announced last month that Ohtagaki is putting his science-fiction manga Moonlight Mile on hiatus while he launches a "big project" next spring. Moonlight Mile will continue after the Gundam mini-series ends. 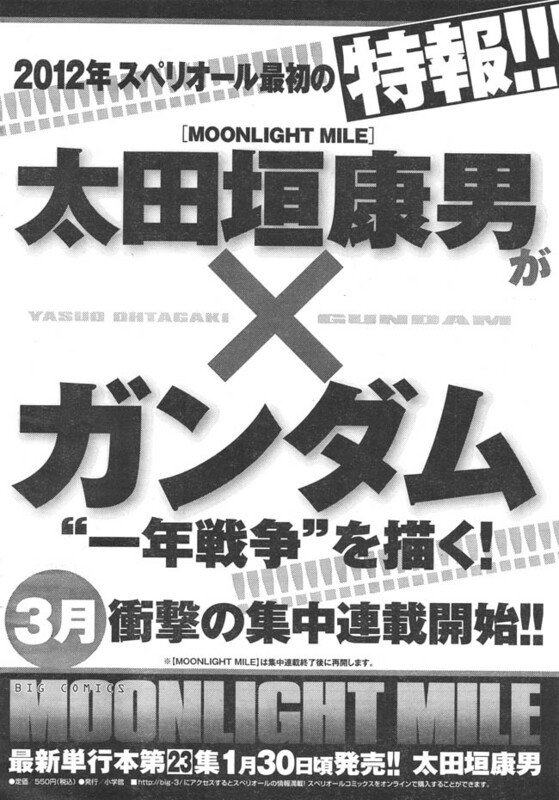 The Moonlight Mile manga inspired the 2007 television anime that ADV Films (and later Funimation Entertainment) released in North America.